Dr. Nafsiah Mboi is a member of the board of trustees of the Indonesian Center for Strategic and International Studies (CSIS) and a member of the advisory board of the National Commission on Tobacco Control. She was Minister of Health of Indonesia (2012-2014) and Board Chair of the Global Fund to Fight AIDS, Tuberculosis and Malaria (2013-2015). Educated in Indonesia, Europe, and the US, Dr. Mboi is a medical doctor who specialized in pediatrics. She also has a degree in public health. 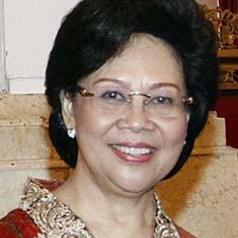 Her professional career spanned 40 years as an Indonesian civil servant with the Ministry of Health. For nearly 20 years of that time she also had a private practice of medicine, initially as a general practitioner and later as a pediatrician. Her medical career in Indonesia has included service in some of the country’s poorest rural communities as well as involvement in development of national policy and plans. More recently she served for six years as the Secretary of the National AIDS Commission (2006-2012) before her term as Minister of Health (2012-2014). She has been in the forefront of the Indonesian response to HIV and AIDS since it first appeared in Indonesia, having been involved at the national and local levels in policy development, domestic and international resource mobilization, and work with affected communities. Her international service through the years has included time as Director of the WHO Department of Gender and Women’s Health (1999-2002) in Geneva, Switzerland. She has also had wide experience domestically and internationally with public service in the fields of human rights, women’s and gender issues, HIV and AIDS, and child rights, including a period of membership and then chairing the UN Committee on the Rights of the Child. Dr. Mboi has been honored at home and abroad for her life of public service, having received the Magsaysay Award for Government Service (1986), and Indonesia’s highest civilian award, Bintang Mahaputra (2014). In 2015 she was named Chevalier of the French Legion of Honor and honored with the Lifetime Achievement Award of the National AIDS Commission.